Is your horse playful, energetic and looking for fun? Do you want to compete in an exciting horse sport without having to ride? Then why not try Horse Agility? 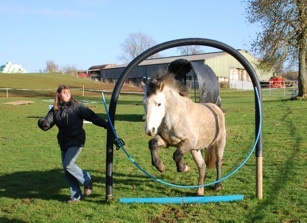 Horse Agility is a fast exciting way to have fun with your horse without having to ride him, so it's great for horses that are unable to be ridden for behavioural or physical reasons, ponies that are too small for the owner to ride, or for people who can't or don't want to ride. It gives everyone the chance to compete without having to ride or spend hours preparing their horse for showing classes. Horse agility comprises a variety of obstacles for the horse to complete, at the higher levels this is against the clock which makes it a great spectator sport in which to participate. 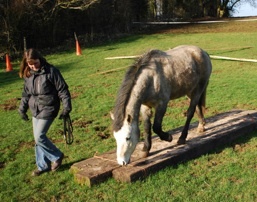 Horse Agility tests your horse's physical as well as his emotional fitness and tests your ability as a trainer to keep your horse travelling safely over the course effectively and with style. 'Thanks for today - totally fun.' - L.C. 'Professional, informative and fun.' - E.K. 'Great Show - really enjoyed it'. - V.A. 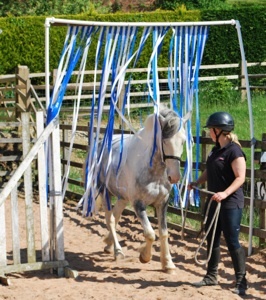 'Thank you Sheila for a fabulous performance it really showed how well your horse training works, quite astounding!' - K.D. Sheila Is currently running training days and competitions every five weeks throughout the year.